“Chestnuts roasting on an open fire . . .” is one of those nostalgic Christmas traditions I’ve known about for as long as I can remember, but up until last year, I had never actually even tasted a chestnut before. 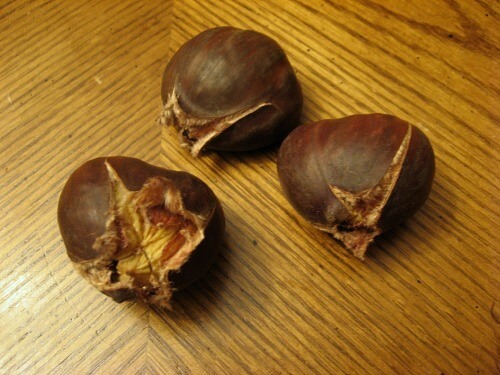 And my first experience with chestnuts wasn’t exactly a very good one either. I found a bag of pre-roasted and shelled chestnuts at the grocery store and bought them, all excited that I was finally, finally going to experience the wonder of having chestnuts at Christmas time. But then I opened up the bag and tasted one, and they were squishy and cold and slimy. Not at all the delicious holiday treat I had been expecting! I had almost given up on chestnuts as something that sounded amazing in holiday songs and movies but wasn’t very good in reality until I went to Old Sturbridge Village last year at Christmas time. Since Sturbridge Village is a 19th century living history museum, there were costumed interpreters there reenacting historic Christmas traditions . . . and one of those traditions was roasting chestnuts over an open fire. The scent of those warm chestnuts mixed with the smokey scent from the fireplace was absolutely intoxicating. And as soon as I tasted one, I was hooked. That was what chestnuts were supposed to taste like. Not the damp and squishy ones I had tried before. At Old Sturbridge Village, my chestnuts were conveniently roasted over an open fire for me, but since I don’t have a fireplace at home, I can’t roast them the old-fashioned way. After becoming practically addicted to those holiday chestnuts, though, I couldn’t very well give them up entirely, so I decided to try making oven roasted chestnuts instead. Roasting chestnuts in the oven is actually surprisingly simple. Maybe not quite as traditional, but a pretty good substitute for people like me who don’t have access to an open fire. The first thing you want to do, is to buy a couple of extra chestnuts besides what you think you’re going to want to eat. There always seems to be one or two in the bunch that have gone moldy inside. They usually look the same from the outside, and it’s almost impossible to tell when you’re looking at them in the store, so it’s always a good idea just to grab a few extra just in case. The next step is to preheat the oven to 400 degrees. While the oven is preheating, you need to cut X’s in the chestnuts so they won’t explode in the heat of the oven and so they will be easier to peel later. Either way, I actually use a regular serrated knife (like the kind you would use at the table to cut a steak) rather than a really sharp knife like many people recommend just in case the knife does slip and get my finger instead. Some people say to cut the X’s in the flat sides of the chestnuts, but when I was at Sturbridge Village, the museum guides there were cutting the X’s in the top part, so I decided to try it that way too. I think it’s a bit easier cutting into the top because then you have the wider base of the chestnut to hold onto and it’s easier to keep your fingers out of the way. Now you’re ready to peel them and enjoy – after letting them cool down for a few minutes, of course, so you don’t burn your fingers. Don’t let them cool down too much, though, or they’ll be really hard to peel. When they’re still nice and warm, the shell pops right off and the inner skin slides off them cleanly. If your chestnuts do cool down too much to peel, though, just put them back in the oven for a minute or two to let them warm up again. 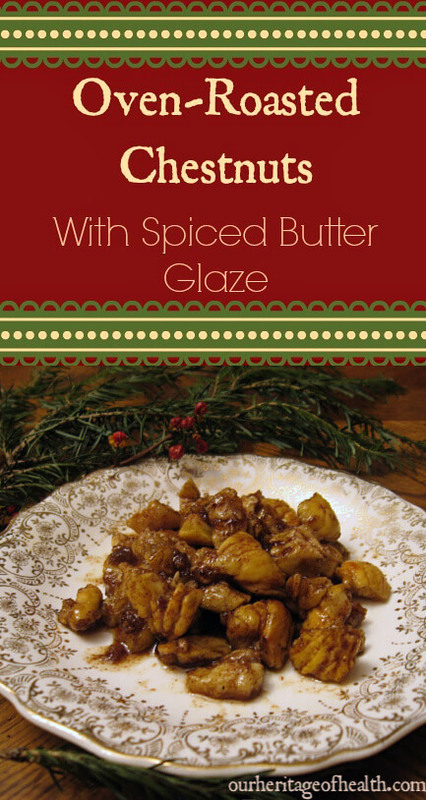 The chestnuts are delicious just as they are, but for a little bit of extra holiday cheer I like to smother them in a delicious buttery spice-filled maple glaze. (Note🙂 The amount of salt and spices can be adjusted to taste. I didn’t measure out the spices exactly, but I used about equal amounts of cinnamon and allspice and about half of the amount of cloves. 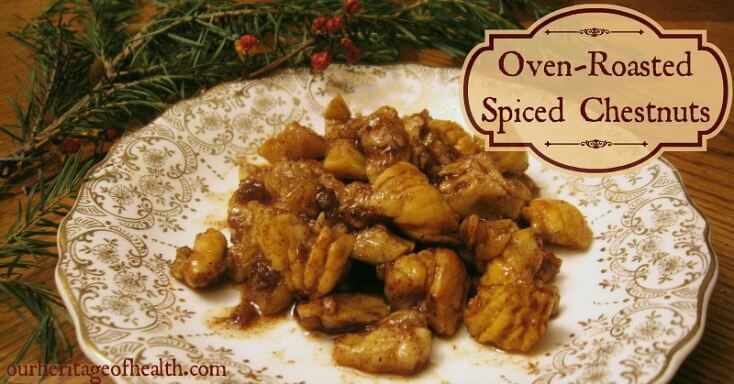 This recipe can also be easily doubled or tripled. Melt butter in a saucepan over medium heat. Stir in the maple syrup, salt, and spices. Then add the chestnuts and stir until they are fully coated with the buttery, spiced goodness. Then pour them out into a bowl or plate, let them cool for a minute if you can wait that long, and enjoy! This post is linked to Clever Chicks Blog Hop at The Chicken Chick, Scratch Cookin’ Tuesday at Granny’s Vital Vittles, Family Table Tuesday at The Polivka Family, Frugal Days Sustainable Ways at Frugally Sustainable, Natural Living Link-Up at Jill’s Home Remedies, Party Wave Wednesday at Holistic Squid, and Fight Back Friday at Food Renegade. I am completely obsessed with chestnuts and cannot wait for XMAS so we (my family) can make more!!! 🙂 I just like them with salt though, they don’t need anything more! 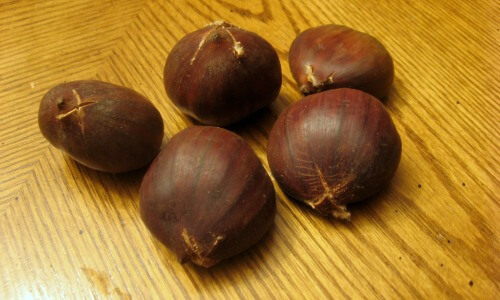 I have always wanted to know how to roast chestnuts and am so excited to try it now! The flavors look amazinng too. Well if this doesn’t sound like Christmas on a plate I don’t know what does! Thanks for sharing at Thank Your Body Thursday! I’m very glad you did! They’re one of my favorite holiday foods now. I’ll have to give the Japanese ones a try sometime!